Omaha has a wonderful historical museum, the Durham Western Heritage Museum. It was down the street from where I worked, and at least once a week I spent my lunch hour there. I saw exhibits ranging from the history of coins and currency in the United States (much more interesting than I would have thought) to dioramas of how the railroad encouraged settlement of the western half of our country. It wasn’t a big museum compared to what I’ve seen in Chicago, but there was plenty there for me to learn about. 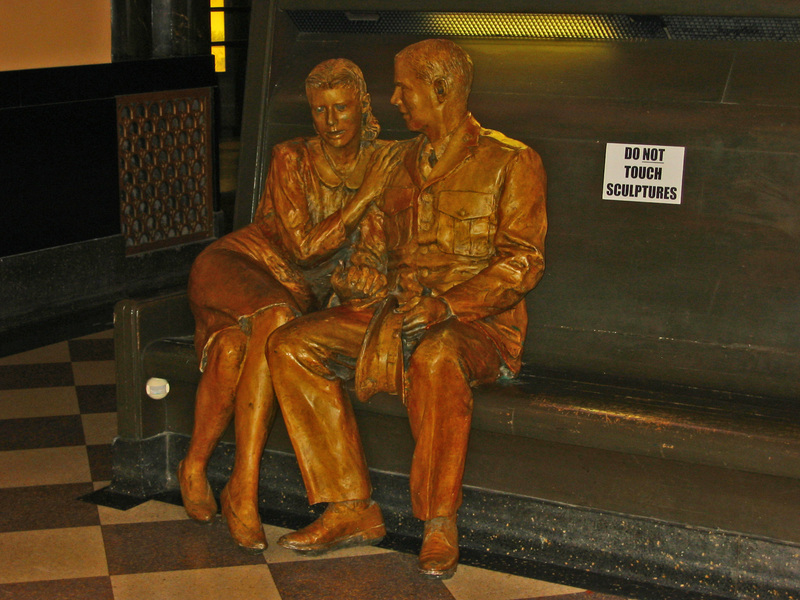 There were also life size statutes all over, depicting scenes such as young men going off to war and families traveling by train. When you got close to them, a motion sensor would set off a recording of the conversation that you might have overhead from the two young men in their uniforms or the mother with her small children. The statues were quite realistic, even down to the placement of a heel slightly off the ground. Word for tomorrow – VARIOUS. If you prefer to work ahead, see the list for the week under “A Word A Day”. Love the sculptor, and your pointing out the position of the woman’s heel. Makes the piece even more natural, than it already looks. Wonder if a couple posed for the work, or if it was done from a photo.